In her years of extensive research into our family history, I don’t think my mother has found a single Italian ancestor for me (nor does Mark have any, despite his father’s spurious claim that he had “hot Italian blood coursing through [his] veins.”) Nonetheless, I believe I’d make a good honorary Italian for this recipe. Essentially, I had about a third of a loaf of bread leftover from last week’s bake, the crust of which was rock hard, but the inside of which (thanks to my latest invention the “long life” bread bag, and yes, I’ll be making a second one soon for your benefit and doing a tutorial) was still soft. So basically I could get a knife through it, but the crust would have broken your teeth. Like many Italians, I didn’t want it to go to waste, though, so I decided to make bread soup. In fact, practically this entire soup was made from leftovers of one sort of another. I am thrifty! Heat some olive oil in a Dutch oven over medium heat, then add the onions, celery, and carrots. 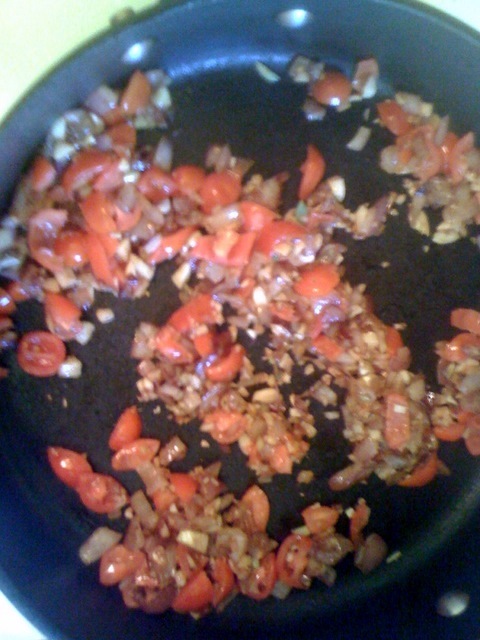 When the onions are translucent, add the garlic and cook for a minute or two, then add the broth, beans, and tomatoes. Bring to a boil, then reduce heat, cover, and simmer for 20 minutes. Season with salt and pepper. 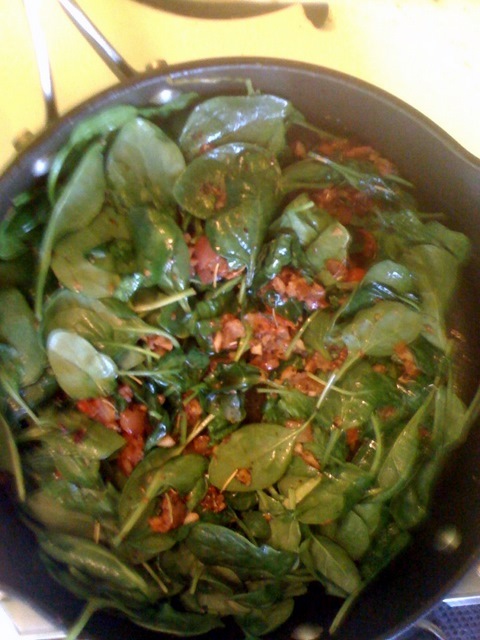 Add the spinach and cook for another minute or two, then add the bread and let it become soaked through. It’s a beautiful day here in Northern Virginia! I’m about to go run some errands, with the top down on my car, it’s so nice! The only downside is the kittens are starting to once again think maybe they should be going outside. Place all ingredients in a blender and blend until smooth. Transfer to a small sauce pot and heat over medium heat, stirring often, until bubbly. For the baked potato, I scrubbed and dried a russet potato, poked it several times with a fork, then poured a little bit of olive oil in my palm and then rubbed my palms together, then rubbed my palms all over the potato to get a thin film all over it. Then I sprinkled some smoked Maldon salt on all sides and put it in the toaster oven at 450 degrees Fahrenheit for about an hour. When it was done, I made a rough seam across it with a fork, then pushed the ends together to make it pop open into a wide boat to receive the veggies and “cheese”. 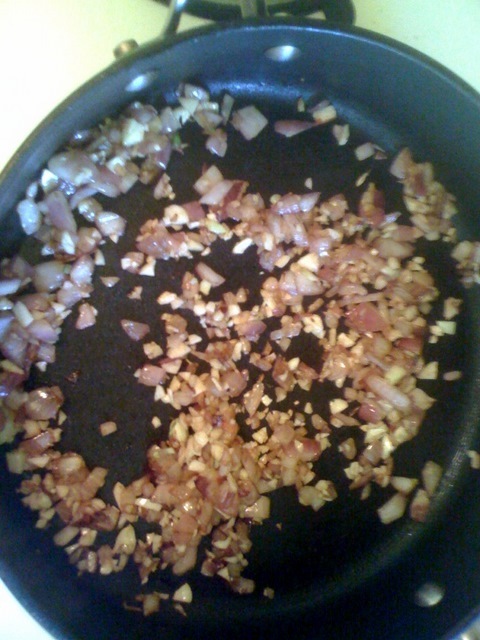 … and some fried onions I found in the cupboard. OK, the fried onions kinda negate the innate healthiness of the meal, but I’ve had a really bad week and damn it, fried onions cheer me up. Mark and I both had off on Monday for President’s Day, and Mark surprised me immensely by announcing early that day that he was going to Wegman’s to buy stuff for dinner. “Are you making dinner? !” I gasped in surprise. Turns out, yes, yes he was making dinner. He made gumbo and it was darn good! I’ve been eating it for lunch all week. I tried to get him to do a post, but I think that would have overwhelmed him. I did snag a photo, though. I didn’t help at all! The last post was crazy kitten-heavy and I’m sure I do have readers that aren’t interested in kittens, and I don’t wish to alienate them, so this is a kitten-free* post. I’m sure they’ll have done something ridiculously cute that warrants a picture next time, though. * It’s not technically kitten-free. If you look carefully at the last picture of the baked potato there is a vaguely kitten-shaped, black blob in the background that is, in fact, Gomez. It’s near impossible to take a kitten-free photo around here. No food tonight, so if you don’t have or don’t like cats, come back in a day or two for an on-topic, food-related post. If you have playful cats that are somewhat destructive, then stick around. The kittens have a bazillion toys, which is good because they love to play. They are quite capable of amusing themselves, but their favorite game is playing with a human-held toy on a string or stick; usually this is a feather on the end of a string, attached to a stick. They leap around like nuts and are generally extremely amusing. However, they are very hard on their toys and tend to destroy them quickly. They eat through strings, so many toys get tied back together again and again until a string that started out several feet long is suddenly a few inches long. They even break the sticks the strings dangle from. And of course, they destroy any feathers on their toys within seconds. And you don’t usually know if feathers were humanely sourced. So I set out to make a heavy-duty dangle-type toy they would have a harder time destroying.
. I think this is the same thing; it was a little cheaper at Home Depot, where they also had longer lengths you can buy separately and cut to fit, which was even cheaper. I bought the kit with 3 36″ lengths because I wanted 36″ and don’t have a saw. It was $10, but I can make two more toys. I bought a few different types of red ribbon for the “feather”. They were 55 cents to $3 a yard at the fabric store, although I happened to get 25% off those prices. I chose red because I have a theory that cats see red best, and I know red was definitely Tigger’s favorite color. The color, of course, doesn’t matter, so get what you want. I got one type of ribbon that was lightly wired, to provide a bit of the stiffness you’d find in a feather. I got another one that was more gossamer, like the soft parts of a feather. And I got a heavier velvet one that was strong enough to attach to the string to without tearing. So pick out some ribbons and then cut them into lengths about 6 to 8″ long. Arrange the rest of the ribbons in a way that they fan out a bit and then put them between the two you’ve sewn together with the buttonhole. Pin. Sew all ribbons together just under the buttonhole. I used a zigzag stitch and went back and forth a few times to make it as secure as possible. You can do this by hand if you don’t have a sewing machine. Cut a length of the elastic. I have found that 30″ the ideal length, so cut 32″ or so. Tie one end through the buttonhole and trim the end. Other than possibly some very sleek, round elastics, most of them will tie a very tight knot that won’t come undone (I had to cut the knots on the prototypes I made that I didn’t like). The cord cover comes with a self-adhesive strip on it for attaching to a wall. You could leave it on and just not peel the paper off, but eventually it’s going to start coming off as you handle it and get all sticky. So just get rid of it now. It took me about two or three minutes to rub the adhesive off with my thumb. I tried using a razor to scrape it off, but the thumb was a lot faster and easier. The cord cover is also flat on one side (the side you peeled the adhesive off of), and rounded on the other. Push the other end of the elastic through one of the holes, then pull it out through the top of the rod. You may need to use tweezers to pull it up, but I just kept pushing it until it popped up on its own. Torticia tends to get lazy and starts lying on her back, expecting the toy to come to her, although I always go and pick her back up and make her play properly because she’s getting pudgy! It’s a bit hard to make Mezzie out in front of the glare on the glass behind him, but here he is leaping from his cat tree. And doesn’t something look really wrong with the angle of Tort Reform’s head in this one? Finally, since this is a cat-only post, here is a sequence of pictures I took the other night after giving Gomez catnip. He’s a surly drunk! Mezzie likes the ‘nip, but Tortellini doesn’t do more than just kind of sniff it daintily and look at Mez like he’s crazy for eating it. But just seconds after eating some and rolling around it in, Mezzian always starts beating his poor sister up! Fortunately, Tort Reform just puts him right back in his place. Okay, that’s it for tonight – back soon with food, I promise! Hello all you fantastic I Eat Food folks. Since I’ve moved to California and returned to school, I have zero time to cook and zero money, so fast, cheap and filling is the name of the game. This recipe is something I eat a few times a week because it fits the bill, and it is just so delicious. Also, the aromatics are gonna make your home smell great. When putting this together I throttle way back on the salt because the Parmesan cheese has a pretty high salt content. 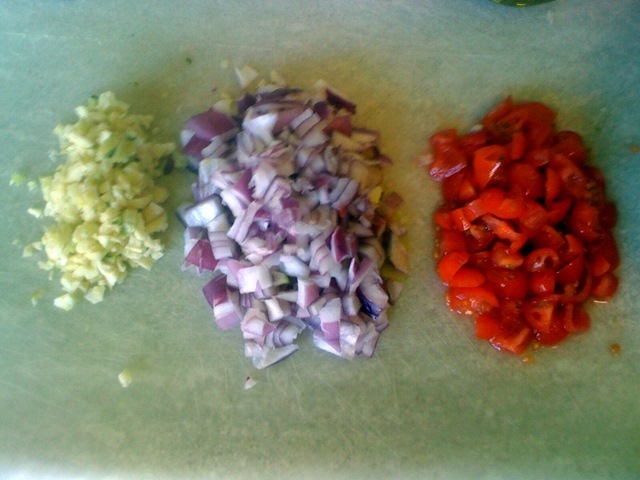 Chop up your garlic, onions and cherry tomatoes. (Keep these separate because you will be adding them individually). Heat a sauté pan with 4 tablespoons of olive oil to medium heat (you want your cooking surface to be hot enough to cook the onions and the garlic down but not so hot that it might fry the garlic). When pan is hot toss in the onions and the garlic with a little bit of salt and pepper. As soon as the onions begin to become translucent reduce the heat to medium low (you want your onions to still have a bit of firmness). 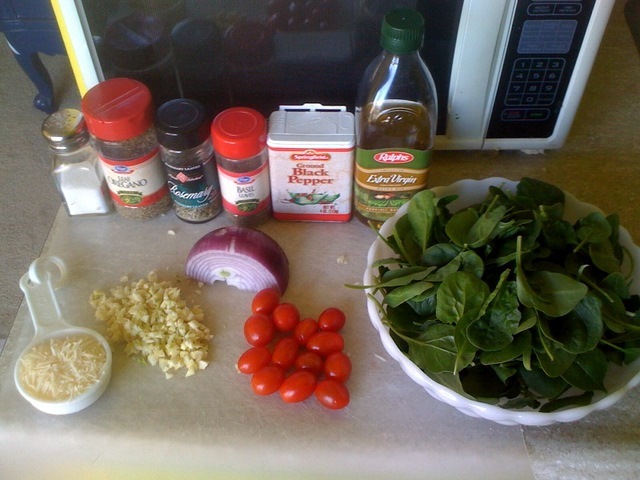 Add in the basil, oregano, rosemary toss that around a few times and then add in the tomatoes. After adding in the tomatoes and after mixing it all up real good, toss in your spinach and continue to incorporate the ingredients and reduce the spinach. 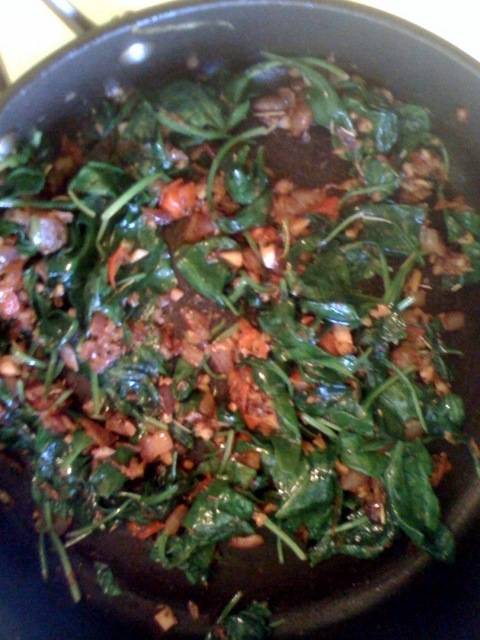 Toss it all about until the spinach wilts a bit (not overly reduced in volume) and then turn off the heat. Let the heat of the pan continue to reduce the spinach. Now toss in the Parmesan cheese and stir it all about. Now put it all into a bowl and eat it up because it tastes and smells so dang good and you are hungry. 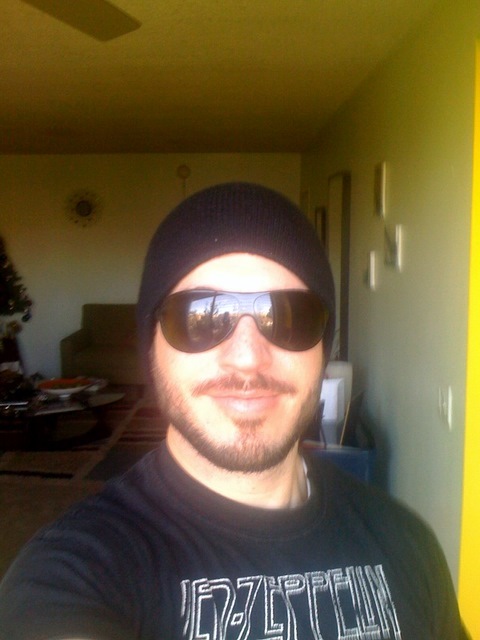 Greetings and happy eatings from Sunny California! Okay, Renae back at the helm. I made this tonight and it was really good. I followed Fort’s instructions exactly, other than the cheese, and using less oil (‘Bras – did you REALLY use 1/4 cup?!). You can just omit it – really, this is good enough that the cheese is superfluous. You can buy commercial vegan parmesan (although I never do this). You can just add a sprinkling of nutritional yeast. You can omit Fort’s seasonings and sprinkle some dukkah on it – I intend to try this next time. Place all ingredients in a blender or spice grinder and blend for several seconds. I just used a tablespoon or so. This will keep in the fridge for a while. I served this with some sprouted quinoa that I made using sun-dried tomato soaking water that I saved a few days ago, with a touch of bouillon. 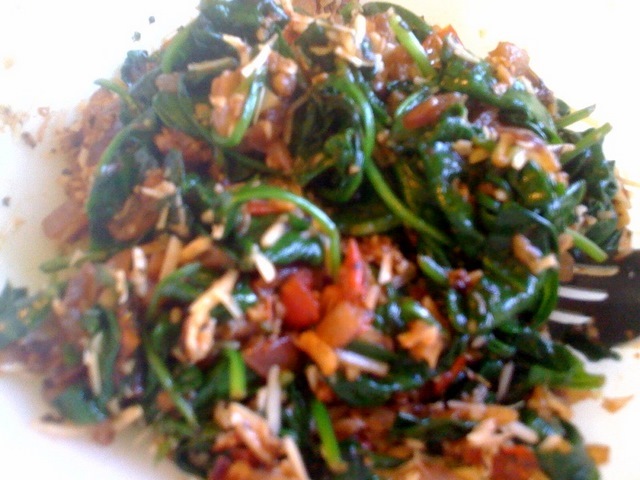 Wow, that was inspired – the quinoa was fantastic and went very well with the spinach. So, thanks to Fortinbras for taking time from his very, very, very, very busy life to share this recipe! Here is Fort’s current favorite picture of us. If I try to make a post without kittens, I get comments demanding kitten action. Fort was in fact here the weekend we got the kittens but he isn’t in any of the pictures I took, and then he went and abandoned me for L.A., so you will have to settle for the only picture I can find of Fort and Tigger. It’s about a gazillion years old, but I remember taking it. 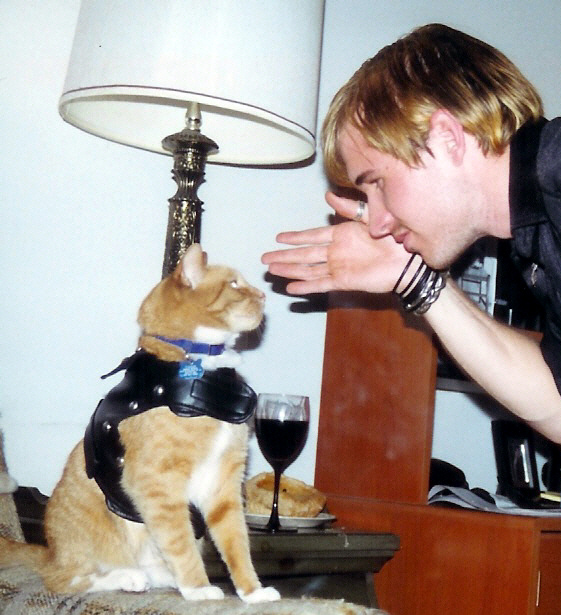 Tigger was being unruly and Fortinbras was trying to tell him a thing or two. Tigger wasn’t listening. There were a bunch of people in my apartment at the time, which just goes to show you that Tigger always had to be right in the middle of things. Boy, do I miss him. And I miss Fort, too. I really need to get to the grocery store today. I’ve been complaining for two days that there is no food in the house. Of course, that’s a ridiculous statement. There is a ton of food in the house. But, in a way that annoys a lot of people – in particular Mark and Fortinbras – all of my food takes the form of ingredients. I rarely have pre-packaged foods around. So if you are hungry, you actually have to make something. From scratch. Sometimes it even annoys me, honestly, though not usually. Anyway, I always have a ton of grains, tinned tomatoes, flour, dried beans, etc. You would not actually starve if trapped in my house for a month or two with no access to a grocery store. But it’s when I have no fresh vegetables around that I start saying I have no food. I’m kind of at a loss at what to do without fresh vegetables as a starting point. Mark kindly went out and got us some dinner from the Whole Foods salad bars last night as I was going out later and didn’t have time to contemplate how to deal with this situation, or just solve it by doing the shopping. But this morning I was again confronted with the problem. What I did have on hand, though, was a bunch of leftover ingredients from meals earlier in the week. I had some pinto beans, nutritional yeast “cheese”, and half a tin of tomatoes. I got excited thinking, “tofu scramble!”, but alas, no tofu. So I started wondering what I could fry up in a skillet with those things instead of tofu. And concluded “rice”. So I put some rice in the rice cooker and started prepping. What resulted probably wasn’t anything most Americans would consider a very breakfasty food, but I’ve called it breakfast because I ate it as breakfast. It would really be appropriate and tasty any time of day. And anyway, the time of day I ate it was noon, so I guess it was more lunch or brunch. Whatever. I called it breakfast, I photographed it, I ate it, it was good, Mark liked it, I’m sharing it. In a large, preferably cast iron, skillet, heat some oil, then add the onions and fry for a few minutes, then add the bell pepper and fry another few minutes. Add the tomatoes, jalapenos, and pinto beans and saute a minute. Add the broth and cheeze, stirring to incorporate the two until they are smooth. Let the mixture become bubbly and thicken slightly. Stir in the rice. Top with avocado if you have it, and serve with fresco and/or Tabasco sauce. In prior food news, I celebrated the new Vegan Pizza Day holiday on January 29 by making a new kind of pizza dough. I’m going to do a post on this crust very soon because it was gooooood. Mark is sitting near me watching Mitch Hedberg videos and it’s making it very hard for me to concentrate on this post because I keep laughing. I will try to soldier on to bring you some kitten photos, though. Gomez has a lot of nicknames. He’s Mez, Mezzie, Mezzikins, Mexicans. I mention this progression of names just because this post was about Mexican Breakfast. So here is Mexicans being extremely adorable. And finally, my mother wanted me to share a picture of her tortoiseshell, commonly referred to as “the most beautiful cat in the world”. This is Casey, from 1995. Mom lost Casey a few years ago and hasn’t been able to replace her. Other than their colouring, Casey and Tortilla Chip have very little in common; their personalities were very different. But Casey was a big, soft, very sweet, quiet, and yes, very, very beautiful girl.